PITTSBURGH -- The rivalry between the Boston Bruins and the Montreal Canadiens got ramped up Friday night with a dose of brotherly love. The Bruins used their first-round pick at the NHL Draft to select Belleville Bulls goaltender Malcolm Subban with the 24th pick. That sets up a future confrontation with Malcolm and his brother, Montreal Canadiens defenseman P.K. Subban -- who is booed lustily whenever he plays in Boston. While future Christmas dinners may become a little awkward at the Subban house, Malcolm says there’s no point worrying about his relationship with P.K. suffering. "I don't know if he's going to like me too much," Malcolm said. "But to be honest, I never liked him that much." Karl Subban – the father of P.K., Malcolm and youngest brother Jordan, a defenseman with Belleville – has always been a die-hard Canadiens fan, so he was overjoyed when his eldest son became a Habs' second-round pick in 2007. 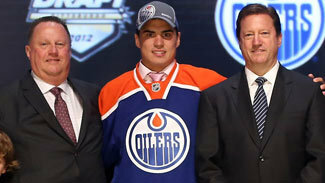 So Malcolm, how do you think your dad will like you suiting up for Montreal’s biggest rival? "He's going to have mixed emotions now," Malcolm said with a laugh. Unlike his dad and older brother, Malcolm Subban did not grow up a Canadiens fan – he was a fan of the local team, the Toronto Maple Leafs. As a result, there isn't too much Habs gear he'll need to dispose of now that he’s on the other side of the rivalry. "I don't have any Canadiens stuff actually," Malcolm said. "I have [P.K. 's] jersey in my room, so that will probably have to get out now." Bruins general manager Peter Chiarelli was pleased to be able to draft the big, athletic goalie, but he was obviously able to appreciate the unique nature of the draft pick. When asked if he made the pick because he felt the Habs-Bruins rivalry was missing some juice, Chiarelli laughed. "Yeah," he said, "we draft on best player available, fit, need and then rivalries." The enthusiasm with which P.K. is greeted at TD Garden in Boston might make things uncomfortable for Malcolm, but Chiarelli doesn't feel the fans will have the same feelings for their new goalie. "I wouldn't think so," he said. "Actually, I like his brother as a player, he's pretty good. I know he riles the fans up in Boston, but all the kids in that family are really athletic. Obviously it's going to be part of the rivalry, and as a by-product it's going to be exciting to watch. "But we're happy to get a good, big goalie."